See some of Japan's strongest men as they conduct their morning practice on this 3-hour visit to a sumo stable. Learn about how sumo is a traditional Japanese sport that was originally performed to entertain Shinto gods. Get to grips with the rules of this uniquely Japanese form of wrestling in which a wrestler tries to force their opponent out of the ring or force any part of his body to the ground. *For tournament season, the tour time would be different. (7:30am-9:30am) So please check our direct message. At 8:00 am, meet your guide at a nearby train station before making your way together to the sumo stable. Get ready to get an insight into this unique Japanese marital art that originated from the religion of Shintoism. 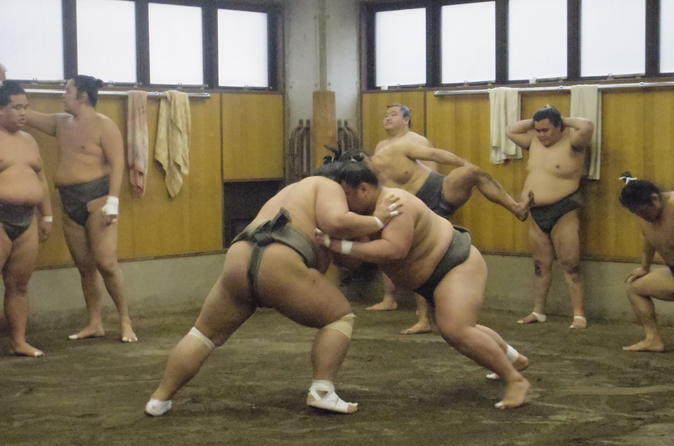 Learn from your guide about how the origin of sumo dates back at least 1500 years, and about how it preserves rituals and traditional aspects of Shinto while also being a major spectator sport in Japan. Before you take your seat, on the ground, in the sumo stable, learn about the six grand 15-day tournaments per year, three in Tokyo, and once in Osaka, Nagoya, and Fukuoka respectively. Observing the rules of silence and respect, quietly watch as the sumo wrestlers practice their techniques. Watch in awe as they put themselves through their daily paces and gain a newfound insight into this ancient art. At the end of the practice, your guide walks you back to the train station where you say goodbye.